and has played a key role in introducing luxury Napa Valley Chardonnay and Pinot Noir to the world. vineyard-driven expressions of exceptional cool-climate wines. 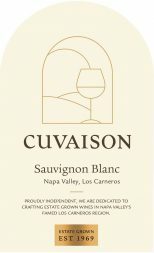 Founded in 1969, Cuvaison is one of the pioneering wineries that helped shape the modern era of Napa Valley winemaking. As an independent, family-owned winery for nearly five decades, we are dedicated to crafting exceptional wines from our acclaimed estate in the Los Carneros region of Napa Valley. To this day, our mission remains true to our roots, and so do our wines. In the vineyard: After a very wet and snowy winter, we emerged from a 5-year drought and plunged into a summer marked by periods of high heat followed by abnormally cold weather. Once the summer ended, the major events that would shape the 2017 harvest began. The ﬁrst was a brief but intense heat wave that shocked the vines and delayed the onset of harvest a few weeks. Once the ball got rolling again, we were able to ﬁnish our 2017 harvest under exceptional conditions. We were fortunate to have picked the last fruit from our Los Carneros estate the same day that the Partrick Road (Nuns) Fire began. This was a part of a complex of ﬁres that spanned Napa, Sonoma and Solano counties and lasted over two weeks. We are thankful that we were spared any damage, and it is no surprise that our 2017 vintage is one to remember. "This wine offers lively acidity broadened by flavors of fig, peach and green apple. Stainless-steel fermented, it remains crisp and focused in the glass, finishing in lemongrass, Meyer lemon and a hint of ginger."